Don’t look now, but your kitchen may be getting smarter. Ordinary appliances now come complete with keypads, LCD displays, and the ability to perform tasks that, until recently, would have seemed like science fiction. Terms such as “multi-functionality” and “dual-use” seem to be the new buzzwords, and even basic, low-tech kitchen furnishings are designed with an eye towards maximum performance and efficiency. 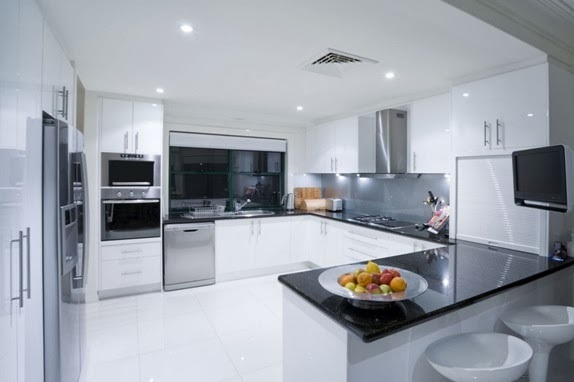 If you’re planning to renovate, and you’re worried that the abundance of state-of-the-art technology will result in a kitchen with all the charm of a NASA command center, you can relax. The trend towards “minimalism” in kitchen décor doesn’t indicate depressing starkness or cold, scientific sterility - it does signal a look that is streamlined, uncluttered and inviting, in which one small, well-chosen detail can state the theme. It is a look in which the glossy plum of the backsplash tile is echoed by a single spray of freesia in a crystal bud vase on the counter, in which the soft tan of the countertop is picked up by terracotta bowls displayed in a graceful glass-front cabinet. And that, of course, is the point. It doesn’t matter how “smart,” “high-tech,” or “multi-functional” your appliances are. In the end, you want your kitchen to be a place in which your personal style shines through - a place that makes you, well…happy. The following trends in kitchen appliances and décor represent minimalism at its best, combining the brains of new technology with the beauty of thoughtful design. Surfing the net: a common household activity. Surfing the net via your refrigerator? Not so common. At least, until now. With the new interactive computer-regulated refrigerators, you can go online, send e-mails and messages, and take advantage of TV/DVD capabilities, all from the center of your kitchen. WIFI-enabled LCD screens contain various apps that allow you to access wire news services and weather reports, check in on social media and search a 30,000-item database for that last-minute recipe. Yet another of the refrigerator’s “smart” functions could spell the end of “sticky” notes, kitchen scratch pads, cluttered refrigerator doors and yellowing tape. Digital reminder and memo features, along with an interactive calendar, allow these sophisticated refrigerators to function as full-service, 24-hour-a-day family communications centers. With nary a curled-up Post-It, in sight. In addition to these digital bells and whistles, of course, the new refrigerators are equipped with programmable settings and push-button control for more traditional tasks, such as keeping food well-chilled and making ice. To reflect the streamlined look of the new “smart” appliances, the modern kitchen cabinets tend to be slimmer and taller than past versions, with floor-to-ceiling styles rapidly gaining ground. Door handles and hardware, finished in weathered or satin nickel, tend to be minimal and un-fussy; “touch-latch” styles are a popular choice. Darker finish shades on cabinets -- such as black walnut, mahogany and ebony -- add a dramatic touch, while lacquer or enamel can contribute vibrancy and visual interest. Aluminum, organic bamboo and treated glass are unconventional but effective alternate choices for surfaces. Glass-fronted, lighted cabinets – as well as those that are completely open in the front -- are an increasingly popular choice for displaying treasured glassware collections and making them part of the décor. You can help your dishes take center stage by using halogen lighting. The focused, well-defined beam enhances shine and makes an effective spotlight. Many of the new cabinets feature convenient pull-out shelving, as well as under-cabinet pull-down knife storage to help maximize counter space and cut clutter. Improved storage options continue with the new under-sink cabinets. Featuring specially tilted and shaped drawers; these cleverly-designed units accommodate under-sink pipes to increase available space. Finally, “unloading the dishwasher” may join “changing the typewriter ribbon” on the list of outdated tasks from the past. False cabinet fronts, with the dishwasher concealed behind them, allow you to store dishes, glasses and silverware in the same location in which they were just washed. Cooking aficionados have long argued the merits of gas versus electric ovens. Gas is prized for its quick ignition and responsiveness, while electric convection ovens are valued for their even performance and consistent temperatures. The new dual-fuel stoves – which combine a gas range top with an electric convection oven – offer the best of both worlds. The oven’s self-cleaning function and its five different rack positions offer additional convenience; some high-end models have sealed burners and include an aluminum-clad central griddle. Whether made of stainless steel or cast-iron, dual-fuel stoves feature a classic appearance that makes them fit in well with modern kitchens. Some are even available in bold, up-to-the-minute jewel tones such as garnet and sapphire. One caveat: dual-fuel stoves can be as much as 6 inches wider than conventional ovens, and can be more expensive to install. In addition, you will need a 240-volt outlet for the electric portion, along with hookup for the gas. In keeping with the current enthusiasm for multi-function, dual-use and “smart” appliances and furnishings, versatile pendant lamps are a runaway favorite as a lighting choice for modern kitchens. Depending on how they are suspended and shaded, they can be used to cast mellow pools of ambient light, or deliver highly focused beams for task lighting. You can use a row of mini-pendants to stylishly brighten up an island or countertop; oversize pendants can cast an inviting glow over the kitchen table while providing drama and dimension to a low-ceilinged room. Another quickly-growing trend in lighting is under-cabinet illumination. Designed to brighten countertops and food prep areas without monopolizing valuable space, under-cabinet lighting also works to play up a dramatic backsplash or countertop. The tops of cabinets can house a lighting arrangement as well, with uplights working to accent the sweep of a high ceiling or call attention to decorative molding. Overhead track lighting, valued for its consistent, even quality, has the added bonus of flexibility. Because the angle of each light can be adjusted, you can customize it to accent specific design elements. Another plus for track lighting: it’s available in energy-efficient options. Whether you opt for a full “IQ upgrade” for your kitchen, with a computer-regulated refrigerator, or merely brighten it up with some new cabinets and lighting, your new “smart” appliances and fixtures should result in a kitchen that is a more efficient, comfortable and happy place to be – a room to which your family is drawn to relax, congregate, communicate and share each other’s company. Creating a beautifully-designed, attracting and inviting space in which your family can spend quality time while enjoying great meals – now, that’s smart.